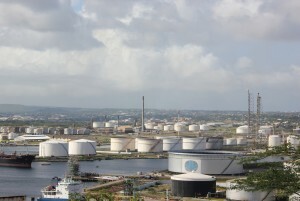 WILLEMSTAD - Workers at Curacao'sIsla refinery operated by Venezuelan state-run oil firm PDVSA began a strike on Wednesday to demand information about the refinery's future. The strike's impact is likely to be limited, however, as the refinery has been working far below capacity due to insufficient deliveries of crude from Venezuela, where oil production has plummeted. One worker said the 335,000-barrel-per-day (bpd) refinery had been processing just 50,000 bpd before workers walked off their jobs. A spokesman for the refinery declined to comment. PDVSA did not immediately respond to a request for comment. The refinery said two weeks ago it was considering offers from 15 companies interested in operating the facility to replace Venezuela's ailing PDVSA state oil company.